Congratulations to the 2003 scholarship recipients (from L): Nancy Mockros, a doctoral candidate at Fuller Theological Seminary, of Swedish/Norwegian heritage, whose areas of interest are theology and culture with an emphasis in film. 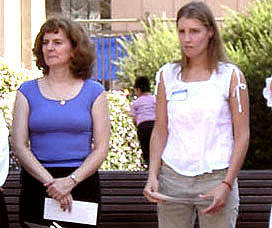 She authored a non-published book on the Scandinavian pietists; Anna Ray Alury, a first-year medical student at UCLA, of Finnish heritage; and Anna Martina Sclöör (not pictured), a pediatric nurse and UCLA undergraduate student, of Finnish/Swedish heritage, studying biopsychology and medicine. The awards were presented in October 2003 during the Fall Scandinavian Festival, at Grand-Hope Park in downtown Los Angeles (photo Dang-Thao Truong).